To no one’s surprise, the U.S. District Court in Little Rock, Arkansas is trying to make my bar grievance against Hillary Clinton go away. I don’t intend to make that easy. On Monday evening, I received a three-line letter from the court clerk stating that my bar grievance was being returned because Mrs. Clinton is an inactive member of the federal court’s bar. I called the clerk’s office yesterday morning and learned that my letter had not even been shared with the judges of the court, so I sent a letter directly to Chief Judge Brian S. Miller arguing that Mrs. Clinton’s inactive status was not grounds for rejecting the complaint. An hour later, I received an email from one of his clerks informing me that “this court is not the proper route” for filing an ethical complaint and directing me to file my grievance with the state disciplinary authority for Arkansas. When misconduct or allegations of misconduct which, if substantiated, would warrant discipline on the part of an attorney admitted to practice before this Court shall come to the attention of a Judge of this Court, whether by complaint or otherwise, and the applicable procedure is not otherwise mandated by these Rules, the Judge shall refer the matter to counsel for investigation and the prosecution of a formal disciplinary proceeding or the formulation of such other recommendation as may be appropriate. Uniform Federal Rule of Disciplinary Enforcement V(A). Note that the judge “shall” refer the matter to an attorney for investigation and prosecution. That’s mandatory. Furthermore, local rules adopted by federal district courts have “the force of law.” See Hollingsworth v. Perry, 558 U.S. 183, 191, 130 S.Ct. 705, 710 (2010), quoting Weil v. Neary, 278 U.S. 160, 169, 49 S.Ct. 144, 73 L.Ed. 243 (1929). Since referral is mandatory and the rules have the force of law, that means I could file a petition for mandamus asking an appellate court to order Chief Judge Miller and/or his colleagues to comply with their own rules. See, generally, In re RBS Sec., Inc., 579 Fed. Appx. 636 (10th Cir. 2014). 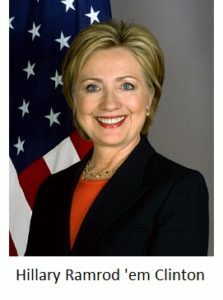 I realize there are significant political ramifications if the rule is followed in this case, namely because Mrs. Clinton is the Democratic nominee for President of the United States, and I understand why the Court might not want to handle such a political hot potato. The grievance against Mrs. Clinton is, however, an important test for the rule of law. Will the rules be swept aside for the sake of political expediency, or will they be applied fully and fairly to someone as prominent as Mrs. Clinton? September 14, 2016 Letter to Chief Judge Brian S. Miller. FBI Director James Comey has already informed us that the rules will be swept aside for the sake of political expediency, and that Mrs. Clinton and her cronies are above the law so far as he and Attorney General Loretta Lynch are concerned. Now the judiciary must decide whether it wants to endorse or repudiate that sort of lawlessness. Chief Judge Miller is a stand-up guy according to what I have read, and I do not think he or the clerk’s office wanted to bury my complaint for partisan reasons (he was appointed by George W. Bush, after all). On the contrary, I suspect he and the clerk’s office wanted to keep the court away from a case that would inevitably become a political lightning rod. I am sympathetic to that concern, but greater issues are at stake here. “In this country the President is not above the law; it is above him, and hence he must be subject to its restraints.” State of Mississippi v. Johnson, 71 U.S. 475, 480, 18 L. Ed. 437 (1866). If that principle applies to Presidents, then it should certainly apply to Presidential candidates like Mrs. Clinton.